This particular set is a nice one from Dragon. It includes four figures and a ton of accessories. These guys are the ones who are the experts at getting through fortifications such as barbed wire. As such, this set has their figures in various poses with one armed with cutters and another with an explosive charge. Naturally, these guys would have to beat a hasty retreat before setting off the charge. As part of the Gen 2 Gear line of figures, these have all their various accessories superbly molded. Now I have to admit that I did not know what the Metaxas Line was, though I had a suspicion it had to do with the Greek campaign. 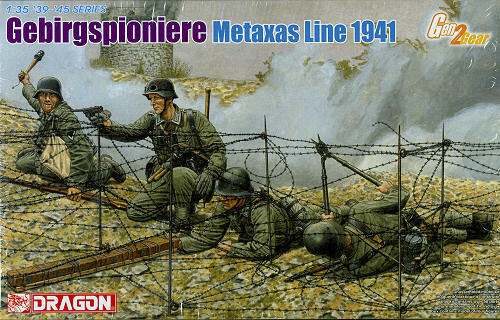 Here is the Wiki explanation "The Metaxas Line was a chain of fortifications constructed along the line of the Greco-Bulgarian border, designed to protect Greece in case of a Bulgarian invasion during World War II. It was named after Ioannis Metaxas, the then dictatorial ruler of Greece, and chiefly consists of tunnels that led to observatories, emplacements and machine-gun nests. The constructions are so sturdy that they survive to this day, some of which are still in active service. Some of them are open to the public." As with all Dragon figure kits, this one has the assembly and painting instructions on the back of the box. These figures are all well molded and can be fit into a variety of diorama scenes or as stand alones.